BEVERLY HILLS, CA--(Marketwired - June 04, 2015) - For years, spas have helped people stay grounded. During the recent West Coast International SPA Association (ISPA) Media Event, numerous spas showcased treatments to help people find a balance of mind, body, and spirit. "The number one reason worldwide men and women visit a spa is to learn how to manage their stress. Learning how to create balance is essential to living a healthy life," said ISPA President Lynne McNees. Balance can be a physical act, through hands and feet, but also mental exercise. Aspira the Spa encouraged individuals to use healing therapies, like Myofascial Release and Unwinding, to reduce pain and restore function back to the body. Four Seasons Hotel Westlake Village provided mini hand treatments containing oxygenated air bubbles. Kohler Waters Spa helped individuals escape and release tension from everyday life stresses with a Deep Tissue Bamboo Massage. Massage Envy Spas assisted people to stay grounded by hydrating and soothing feet with a lavender scent sugar scrub featured in their Sugar Foot Therapy. The Mayo Clinic Healthy Living Program provided individual posture analysis and tips on how to improve poor posture from everyday life habits. Miraval Resort and Spa revealed their Tibetan Chakra Balancing session which allowed healing sounds, cleansing power, and vibration from the Tibetan bowls to surround individuals. The Oaks at Ojai offered a take home salt scrub, Pixie Tangerine Salt Scrub, which contained fresh picked pixie tangerines and olive oil to inspire relaxation. Spa Montage showcased their Elements of Wellness Treatment that displayed a blend of essential oils during a therapy session for a balance of mind, body, and spirit. The spa industry has been helping people not only feel their best, but also look their best with facials and makeovers. Colorescience featured a celebrity makeup artist that addressed skin care concerns and questions while performing makeovers to enhance individual beauty. Island Spa Catalina displayed their Mini Sea of Life Refresher Facial featuring OSEA skincare that provided a pure, organic, and vegan ingredients straight from the sea. Stemulation Skin Care educated individuals about stem cell research and the science behind it, as well as provided a Mini Facial Rejuvenation Treatment to enhance complexions. Media were able to pre-book treatments through the appointment software ResortSuite. Through a partnership with FEED, every attendee received a FEED tote bag. The proceeds from these bags go to feeding a total of 15,000 hungry children through the World Food Programme. The bags are sponsored by Spa Week. ISPA President Lynne McNees is available for interviews; please contact Allie Hembree, allie.hembree@ispastaff.com to schedule. 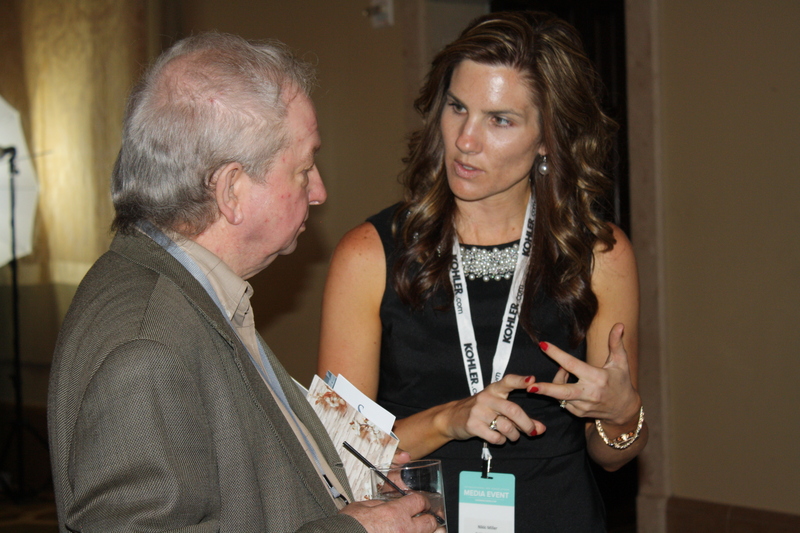 A representative from Kohler Waters Spa talks with a journalist during the West Coast ISPA Media Event.